Travel suppliers, including airlines, are looking at various issues to have a say early in the booking funnel. This way passengers would have a stronger brand affiliation, plus the probability of targeting the “second wallet” would go up. · If booking a flight isn’t only about price and destination but also timing (say weekend vs. weekdays) and social context (family, individual, colleagues etc. ), then how the same is reflecting on an airline-owned channel? · Are travellers “converting” faster on platforms such as Airbnb.com when compared with an airline or a hotel site? · What is the likelihood of a traveller opening an app from Google or a 3rd party app rather than the airline they flew with when they arrive at a destination? When a user ends up on an airline-owned site, there is an immediate need to come to grips with one aspect – what is the traveller looking for? Is it a leisure trip or a “bleisure” one? The ideal situation would be to generate enough data within your own user ecosystem to truly understand where and why people are planning to travel. Airlines have to focus on pre-booking engagement. The options presented to the user shouldn’t be merely about “where to go” (what if this option doesn’t come into the picture in the first interaction at all!). “Airlines have had poor representation in this arena (the pre-booking phase) and have handed over the advantage to 3rd party sites,” said Matt Walker, Chief Storyteller, LikeWhere. And when the main curators of the pre-booking phase happen to be players like Google, Facebook etc., the threat of these players going deeper into the booking funnel is worth noticing. This is where companies like LikeWhere are stepping in, trying to build a bond with travellers via knowing about them “on the fly” (even without any previous history of knowing them). So the core idea is to offer what is being termed as “smart travel content”. It is presented by a layer of intelligence that ensures that the content shown would complement a traveller’s likings. “Lifestyle preferences and lifecycle timing are the two metrics of customer relevance in digital,” says Walker. LikeWhere focuses on personalising destination discovery and eventually enables airlines to position themselves for the main booking/ancillaries. If one searches for “ATP World Tour Finals 2018 London”, which is scheduled to take place from 11-18 November, there is no simple way to book around a complete trip including tickets for matches, hotel, airline ticket etc. It remains a fragmented experience. There are attractive packages for the tournament – hospitality packages, private suite at the venue but nothing more. A site, https://www.tennistours.com, came close to offering a travel package but the link didn’t work! This was after browsing top 10 links on Google. So a disjointed shopping experience continues. It is worth watching how travel technology specialists crack this conundrum. Also, since airlines didn’t figure in the search on the first page, how many airlines are in a position to understand that a traveller is visiting London for a reason and offer a relevant package? So in this case, an airline should target the purpose of the trip, come up with suggestions/ tips that enhance the stay and then inch towards the first part of the booking, which could be an airline ticket or even the main experience that the customer is looking for. Other than content, airline can also bank on the devices being used. For instance, the mobile phone is a highly personal device, and offers an opportunity to capitalize on certain innate features, such as location. Also, as mobile becomes the primary device and since users don’t like to search on it (easy to mistype, to make mistakes), airlines have to preempt what users are likely looking for, based on their context, and bring them relevant content from the moment they access their devices. Based on the intelligence garnered from the device, plus a host of other signals, one can expect a suggestion for a dinner (say the app is opened at 7pm, so the first recommendation is triggered according to the context). Airlines need to increase the width of your funnel to allow for a higher quality of user engagement. This can happen earlier on in the booking process. The "engine room" of search and booking may be tough to change from the outside-in. That doesn't mean that airlines can't experiment today with new layers which broaden the funnel and increase loyalty. Full service carriers have mainly focused on safety and operations for years. But it is time for them to be a part of a digital economy. Otherwise they would continue to get behind in the race of fulfilling customer expectations and being ready for modern commerce. It is being acknowledged that airlines need to gear up for an entrepreneurial or innovation culture. “Airlines need to embrace rapid learning cycles, experimenting, and empowering autonomous teams to innovate and validate at speed, says Bill McKimm, Business Development Director, Thoughtworks. “Airlines need to structure their talent pool, how they bring agile principles into their respective businesses and work out a plan to deviate from their current architecture to a targeted one over a period of time as per a roadmap.” This needs to be worked, even though business continuity and no “downtime” are critical factors while working on such a major transformation. McKimm referred to the significance of being “agile” and how a prototype of a new offering is crafted with the least effort possible to be used for validated learning about customers. An agile development team works on such minimum viable product to a subdivision of their users to test a new idea, to garner data and doing so learn from the whole exercise. Also, the chosen architecture paves way for the development team to deliver rapidly. Also there is a provision to leave endpoints as an API that will be consumed by other apps. As for making the most of 3rd party offerings, the adaptive platform with API interface helps in getting associated with start-ups, innovators etc. in a flexible manner. Airlines need to gear up for the digital world, which brings significantly different complexity and speed, something the likes of network carriers weren’t used to in the classical economy. It is time to do away with slow, incumbent development processes, technologies and applications to deliver change. Airlines have to be ready - digitally enabled end-to-end, by working out new digital front-end experiences, and seamlessly connecting these to the back-end systems. At the same time, the journey of digital transformation needs to be understood because transforming a business involves an element of risk, too. · Avoid quick wins: Do away with the mindset of “incrementalism”. It is being pointed out that if organizations end up settling for commodity-level task for incremental enhancements then it won’t serve the purpose. Don’t incentivize the team to progress only for quick gains. In one of his recent posts, Dave Thomson, Head of Product at Skyscanner, wrote that with this approach, one can avoid “big scary problems”. Thomson referred to a couple of possibilities where such mistakes happen –relatively larger businesses tend to be susceptible and the lack of precise and linked goals letting executives/ teams to work on an idea and deliver it. He says “think of quick wins as handing a lifeline to your competitors” and letting them “entirely leapfrog everything you are doing”. Thomson’s recommendation: think of “the network effects that exist within marketplaces, it’s better to swing for the fence and miss than not swing at all”. · Adopt fail fast attitude: Make learning as transparent as possible. For those keen on sharing learning, they go for reasonable prototypes, test them with users, and constantly refine them until they reach a minimum viable product. User experience professionals point out that focus must not be on the functional attributes of your product or service, but instead on the context for how customers purchases and use them. “A great user experience isn’t enough. Airlines need to be connecting user experience with conversion rate optimization, but this isn’t happening today because most airlines don’t understand the relationship between the two. We are constantly seeing airlines spend 6 months to 1-year designing a new digital experience, then they spend another year building this new digital experience, but by the time they have the new experience live it is 1-2 years old. This process can’t continue for airlines to be successful,” says Mike Slone, Chief Experience Officer, Travelaer. “(Airlines) They need to develop a “fail fast” attitude. 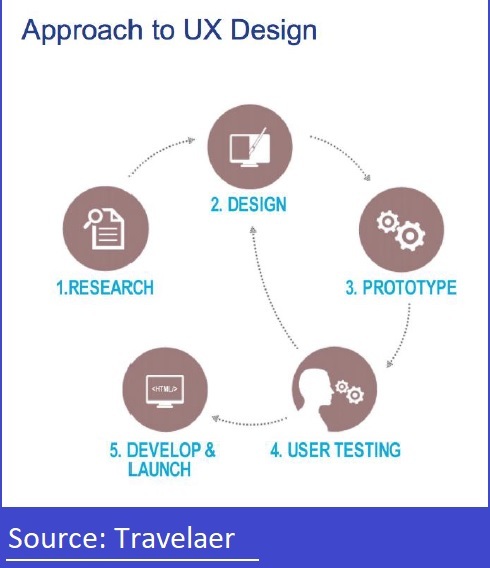 One that allows them to quickly produce new innovative digital experiences, launch them, observe successes and failures, revise the user experience, observe and measure, and then optimize and redesign again- this should be a constant process, not one that is started every few years after you realize that your user experience is old and outdated. Airlines are not agile enough and most are not willing to fail fast, thus they will always be behind until they change their internal processes to stay ahead of their customers,” shared Slone. · Go for growth culture: Specialists point out that digital transformation is certainly not about assets, it’s not even about processes and methodologies. It’s about culture. As a digital organization, Air New Zealand encourages a culture of curiosity, learning and problem solving, while providing clear direction and support. Companies like Skyscanner are very particular about agile developments cycles and speed associated with it. Focus on setting up small, cross-functional, dedicated teams. They work on a small set of tasks together as a unit, and get feedback and clarification from each other continuously. In these companies engineering, growth, data science, and product operate together as much as possible. They deliver very fast, ensure teams are never afraid of trying new things and offer them ownership and independence in their functioning. Failure is part of their daily routine, as there is a culture of forgiveness and experimentation. · Governance team: Datalex recommends putting in place an agile governance team. Blair Koch, Datalex CTO and President USA asserts that this team should feature senior leader representation from all the functional leaders involved in the scope of the digital transformation. “The roadmap developed should show how the transformation will take you from the current state to the future state and include a dimension of time, preferably at least quarterly “releases” of capabilities. The roadmap should be 24-36 months in duration,” wrote Koch in his posting. · Role of travel technology: The future of an airline’s digital success is building their own “best of breed” platform that can incorporate seamlessly the best travel tech products or modules into one experience. “Relying on one Internet Booking Engine or one travel tech partner is often a mistake because the airline is held back by the abilities of one provider, when they could be advancing by working with multiple providers. Some airlines will always want the “easy button,” but the innovative airlines will push beyond the spoon feeding that happens from the large travel tech providers,” said Slone. Airlines are starting to use sophisticated tools not produced by travel tech companies to improve their ability to personalize and adapt the content to their customer’s needs. Hear from experts and assess the journey of travel companies at the upcoming Mega Event Asia-Pacific (Ancillary, Loyalty and Co-Brand Conferences) to be held in Bangkok, Thailand (28-30 August, 2018). It is imperative for airlines to refine their commerce expertise in order to come up with tailored offers for travellers. The requisite capabilities need to embody proficiency in revenue management, dynamic pricing, merchandising etc. and deliver on several counts be it for upselling ancillary services across a passenger’s journey or controlling offers across all the channels. Airlines have been attempting to optimize the order value per passenger depending upon parameters such as travellers’ location, frequency of their trips etc. There have been concerns pertaining to what is limiting such exercise, for instance, is it data silos that inhibits the single view of the customer and this in turn restricts the ability to fully understand the intent of travellers? What about privacy violations and wrong end user identification? How are modern e-commerce platforms facilitating this? Ai’s Ritesh Gupta spoke to PROS’ Regional VP – Travel, EMEA, Gary Mayger about the current status of personalized pricing. Ai Video: Where do GDSs stand with NDC XML API distribution? IATA’s New Distribution Capability or NDC has always resulted in intriguing deliberation around how this communication protocol is going to impact the functioning of GDSs. Considering the current situation, be it for NDC schemas or non-NDC schemas, it isn’t realistic or even pragmatic to point out that the role of GDS companies wouldn’t count. There are no reliable statistics for the market penetration of NDC bookings, but it is believed to be very low. Travellers tend to visit 35-40 sites before booking a vacation, a number which travel e-commerce players are trying to cut down by embracing an experiment-driven design process for their respective digital assets. As much as airlines can benefit from being in the consideration set early on in the booking funnel, specialists point out that they aren’t doing enough when it comes to targeting the “second wallet”. According to Iztok Franko, founder, Diggintravel, one of the two hurdles as far as ancillary revenue generation is concerned happens to be the lack of a user-centric (UX) mindset. The other challenge is - IT and platforms not being flexible enough. As per the findings of the 2018 Diggintravel Airline Ancillary Revenue Survey, airlines are in the early stage of applying the conversion optimization process to ancillary upsell and cross-sell activities. “Without a real user-centric approach to digital UX, you can’t do any real digital merchandising,” says Franko. In order to be adept at selling what travellers require for their trips, airlines need to perform user testing on a regular basis. Focus needs to be on agile quick development cycles, for which airlines need to be in control. As we talk of the cultural change, alongside roles such as marketing data scientist, product designer, cloud engineering etc., airlines need to embrace new ways of running a digital organization – can there be a culture of curiosity, learning and problem solving? Is there scope for experimentation? What is failure in quick development cycles and how the same paves for positive results? Some of the bigger OTAs such as Booking.com and meta-search engines such as Skyscanner have already made deep forays into the same. All of this is as important as airline-specific systems that are being considered for creating personalised offers or serving passengers at all touchpoints. 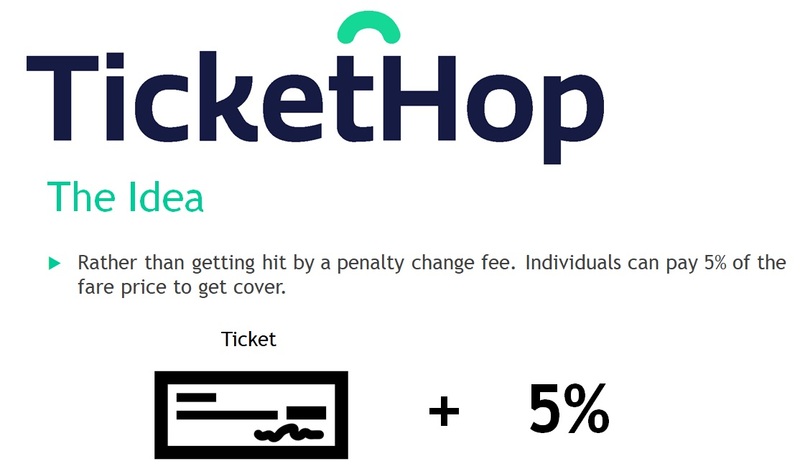 Ai Editorial: TicketHop, a start-up based in the U. K., intends to provide a workable solution to provide flexibility when it comes to change fees. Ai’s Ritesh Gupta explores how founder Laurence Shepley is dealing with an issue that tends to be annoying for passengers. There are certain confrontational issues that are associated with air ticketing and one of them till date is costly airline change fees. How much does it cost to change or cancel an airfare? What are the conditions that entitle a passenger to amend or cancel their reservation without paying a fee? These questions are common and ones that can leave a passenger disappointed or pinches their pocket in case they decide to change their original booking. It is common to see a full-service carrier in the U. S. charging a $150-$200 change fee for paid domestic flights. “Change fees are a significant source of income for airlines: typically 2% of revenue. But they are resented by passengers whose travel plans can change for the best of reasons. Why not share the load and spread the cost across all passengers?” questions Laurence Shepley, founder of a U.K.-based start-up, TicketHop. Sensing an opportunity, Shepley has come up with a venture in TicketHop. The company’s idea: Rather than getting hit by a penalty change fee, a passenger can pay 5% of the fare price to get cover. For a small % increase addition to the ticket price individuals who join TicketHop can combat uncertainty around their travel, if any. This way there is flexibility in the manner in which a traveller intends to fly. “We are unique in that we provide a workable solution to provide flexibility when it comes to change fees,” asserts Shepley. TicketHop intends to introduce a small charge affordable for all the passengers and overall increase revenue generation for airlines. “The plan for the near future is to partner with an airline, so we can progress to building the software and put the idea into action, said Shepley. Ai: Can you talk about the idea of setting up TicketHop? Was it from a personal experience that led you to start this venture? Laurence Shepley: Before the name TicketHop, the idea was called ATEC (Automated Ticket Exchange Club). (It was planned as) a membership that allowed individuals to exchange air fares. It came about when Viagogo another ticket exchange system stopped serving Manchester United. Although not at all related to my idea, I remembered the ease at which individuals could get tickets for a match. I then began to realise the need for more flexibility within the airline industry, especially when my family was hit by a large penalty to change flights with United Airlines. Why don’t the airlines make money out of something that people want i.e. more flexibility? As we know all airlines over a full fare which does offer this flexibility, however it is far too expensive for the majority. So, I concluded that individuals would pay for it so long as it was cheap. Ai: How would it work for travellers? Can you cite an example in case of a cancellation? Laurence Shepley: Let’s take James. He is going away in six months’ time, however a couple of weeks before departure he must change. He does not have to fear thou as he has his TicketHop cover. Ai: So how would it work? Laurence Shepley: James bought a ticket from an airline (let’s say worth £40). TicketHop then comes along and charges 5% extra (£2) it is cheap enough for James to get regardless of whether he is certain he wants to fly or not on that day. By getting this cover he becomes a member of TicketHop, which allows him to resell his ticket to another member of TicketHop only for the same price he bought it for. There is no profit, just his money back. This process is actually done by TicketHop on his behalf so there is no chance of any misconduct. In the case that no buyer at that time can be found he will receive a voucher from the airline to the value of 100% of the ticket to be used within 12 months with that same airline. This encourages the passenger to return to that airline. We connect travellers with similar likes this maybe travel or hobby related. Once they have a common ground they are more likely to advise each other on what is a great place to visit destination wise. If say James encourages Ben to go and visit a hotel he has just been to, James could get a commission back from the hotel. We ask the member what their favourite airline is when they first use the product. If they choose Air India for example, then we will advertise Air India flights on their app. So, all they see is Air India (this does not prevent them searching other flights on the app). As for affiliate marketing, TicketHop will actively work out what products would best suit that member based on where they are going, which greatly enhances the likelihood of them purchasing. The member can also tailor the type of products that are being shown to them. They are just some of the areas that TicketHop is looking to get involved in. Ai: How is it going to enhance value for airlines? Laurence Shepley: It will result in more revenue generation. As per our plans, 99.5% of the extra charge will be passed back to the airline. This will do more than just cover old cancelation fees. It will greatly increase revenue. By how much you may ask? £4 per passenger. Plus, this will result in more passengers. TicketHop will increase the number of passengers that the airline flies. Individuals will now be able to book earlier as they become more flexible. But remember the price is so cheap it is very unlikely that you will see an increase in people changing. After all people don’t book a flight just to change.